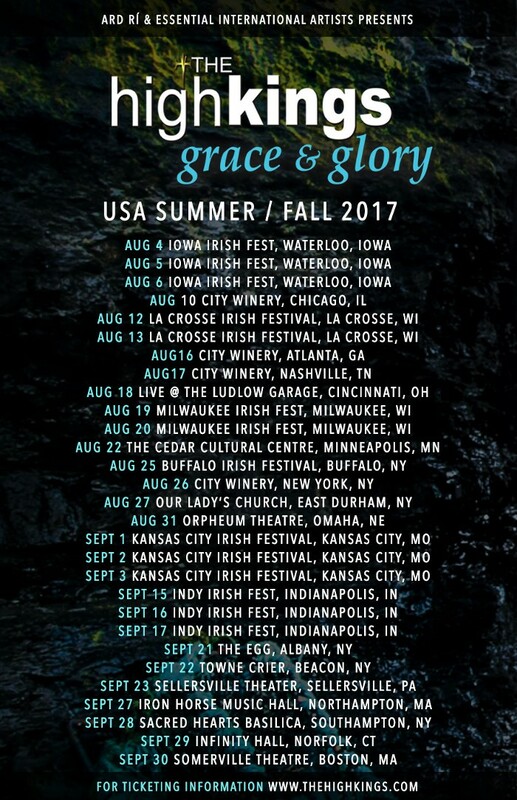 The High Kings, often referred to as ‘the true heirs of Ireland’s folk heritage’, have just announced the Summer & Fall Schedule for their ‘Grace & Glory Tour’ following unprecedented demand for tickets on their recent US Tour in March 2017, which saw most shows sell-out well in advance. The High Kings live shows are legendary across the world, enjoyed by millions of music fans over their 9 year career. Their unique brand of high-octane balladry and folk has won them numerous accolades and the new studio album, Grace & Glory continues that tradition. In its first week of release the album went to #1 in the Irish Independent Album Charts and received widespread critical acclaim, and charted in the Top 10 in the USA, Germany and the UK. The Grace & Glory Tour features songs from the new album as well as many fan favorites from their catalogue. The tour begins in early August in Waterloo, IA and ends at the legendary Somerville Theatre in Boston, MA at the end of September. See the tour page for full listings and ticket links.